DIE Lunæ, 19 die Novembris. Ld. Butler, reflecting Words upon the D. of Bucks and Ld. Ashley. The Lord Viscount Fauconberg reported from the Committee, a Proviso concerning bringing over the Relief of the Kingdom of Ireland to the Inhabitants of the City of London in Dead Cattle; which is offered to the Consideration of the House. The said Proviso being read, the House took the same into Consideration. And, in the Debate thereof, the Lord Ashley took Notice of some Expressions of the Lord Butler, as reflecting upon his Lordship; which gave him Occasion to desire Reparations from the Lord Butler. The Lord Butler explained himself, that he did not intend any Reflection upon the Lord Ashley by what he said. The House, conceiving it an Offence also to their Lordships, commanded the Lord Butler to withdraw. 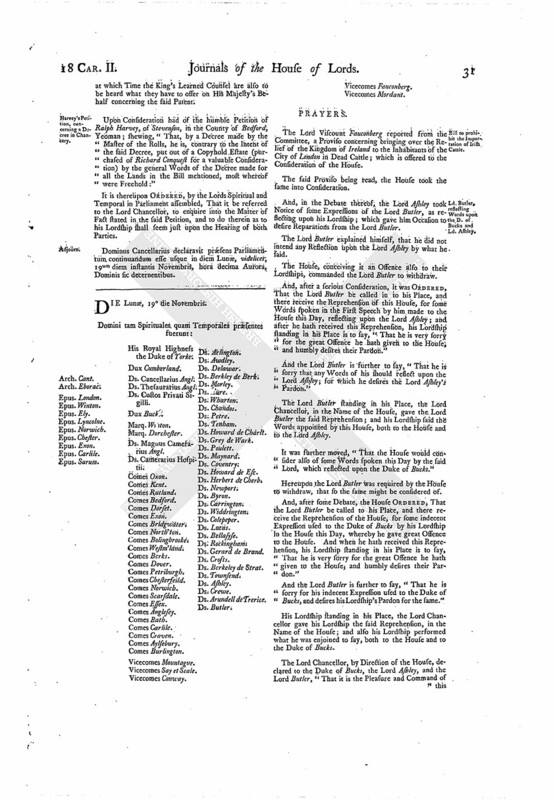 And, after a serious Consideration, it was ORDERED, That the Lord Butler be called in to his Place, and there receive the Reprehension of this House, for some Words spoken in the First Speech by him made to the House this Day, reflecting upon the Lord Ashley; and after he hath received this Reprehension, his Lordship standing in his Place is to say, "That he is very sorry for the great Offence he hath given to the House, and humbly desires their Pardon." And the Lord Butler is further to say, "That he is sorry that any Words of his should reflect upon the Lord Ashley; for which he desires the Lord Ashley's Pardon." The Lord Butler standing in his Place, the Lord Chancellor, in the Name of the House, gave the Lord Butler the said Reprehension; and his Lordship said the Words appointed by this House, both to the House and to the Lord Ashley. It was further moved, "That the House would consider also of some Words spoken this Day by the said Lord, which reflected upon the Duke of Bucks." Hereupon the Lord Butler was required by the House to withdraw, that so the same might be considered of. And, after some Debate, the House ORDERED, That the Lord Butler be called to his Place, and there receive the Reprehension of the House, for some indecent Expression used to the Duke of Bucks by his Lordship in the House this Day, whereby he gave great Offence to the House. And when he hath received this Reprehension, his Lordship standing in his Place is to say, "That he is very sorry for the great Offence he hath given to the House, and humbly desires their Pardon." And the Lord Butler is further to say, "That he is sorry for his indecent Expression used to the Duke of Bucks, and desires his Lordship's Pardon for the same." His Lordship standing in his Place, the Lord Chancellor gave his Lordship the said Reprehension, in the Name of the House; and also his Lordship performed what he was enjoined to say, both to the House and to the Duke of Bucks. The Lord Chancellor, by Direction of the House, declared to the Duke of Bucks, the Lord Ashley, and the Lord Butler, "That it is the Pleasure and Command of this House, that they all acquiesce in the Determination of the House in this Business, and stir no more therein; for the Offender therein will be severely censured by this House." ORDERED, That, upon Wednesday Morning next, this House will proceed further in the Consideration of the Proviso reported this Day concerning the Irish Cattle. 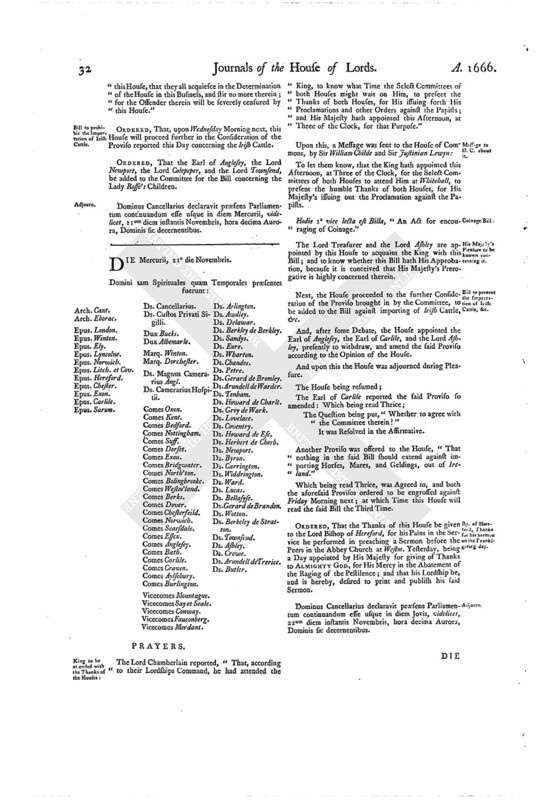 ORDERED, That the Earl of Anglesey, the Lord Newport, the Lord Colepeper, and the Lord Townsend, be added to the Committee for the Bill concerning the Lady Rosse's Children. Dominus Cancellarius declaravit præsens Parliamentum continuandum esse usque in diem Mercurii, videlicet, 21um diem instantis Novembris, hora decima Aurora, Dominis sic decernentibus.